Standard dwarf bearded irises (SDBs) are defined as bearded irises between 20 cm (8 inches) and 41 cm (16 inches) in height. But behind that simple definition is an exciting story of the creation and development of a family of wonderful garden plants unknown in nature, beginning with two curious hybridizers collaborating on an experiment and culminating in what would become an enormously successful class of irises, second in popularity only to the tall beardeds. The story begins in the 1930s with Robert Schreiner seeking out seeds of the dwarf bearded species Iris pumila, native to eastern Europe. There were already dwarf irises grown in gardens at that time, nearly all of them derived from Iris lutescens, a species native to the western Mediterranean: Italy and southern France. There was not much potential in breeding these dwarfs, however. The color range was limited (yellow, violet, and occasionally off-white), and attempts to add more variety by crossing them with tall bearded irises produced only sterile intermediates, a dead end as far as improving the dwarfs was concerned. Iris pumila offered the prospect of something new for dwarf breeding. Although not grown in western Europe or North America, it was known to iris specialists. It was one of the iris species originally listed by Linnaeus, and was described in W. R. Dykes's The Genus Iris and other sources. It is a truly diminutive iris, virtually stemless, with the tip of the blooms often only 10 or 15 cm above the ground. Its range of colors is delightful: yellow, cream, pure white, violet, purple, and blue, almost always with a darker spot on the falls. Instead of just lamenting its unavailability from commercial sources, Schreiner initiated communication with plant enthusiasts in eastern Europe, and was eventually able to import some seeds of this promising species. By the 1940s, Iris pumila was being grown by a small handful of iris hybridizers in the USA. Two of them, Paul Cook in Indiana and Geddes Douglas in Tennessee, decided to exchange pollen. Iris pumila was blooming in Indiana around the same time as the tall beardeds were blooming in Tennessee. The results of these crosses delighted them both. The stems grew about 30 cm in height, only slightly larger than the garden dwarfs of the time. There were two buds at the top of the stem, and often a third on a short branch. The flower form was perky and modern by the standards of the time, and the colors were bright and varied wonderfully. And, most extraordinarily, these new hybrids were fully fertile and could be bred with one another for as many generations as the hybridizer desired. These were the first of a new type of iris, now called SDBs. Paul Cook introduced the first three to the world in 1951: the clear yellow 'Baria', blue 'Fairy Flax', and white and green 'Green Spot', which achieved an enduring popularity among iris enthusiasts. The creation of these new hybrids soon caused controversy. Were they dwarfs or were they intermediates? Many dwarf enthusiasts insisted on the latter view. Iris pumila was a dwarf, after all, and crossing dwarfs with TBs was the classic recipe for intermediates. Furthermore, they argued, no true dwarf iris could have a branched stalk, which SDBs often did. Others, however, noticed that these new irises were much closer in size and general appearance to the dwarfs than to the intermediates, and preferred to just stretch the definition of "dwarf" a little bit to accommodate the new hybrids. Geddes Douglas thought they should be in a class by themselves, neither dwarf nor intermediate, and proposed calling them "lilliputs". By the mid-1950s, those who preferred grouping the new irises with the dwarfs had prevailed. The AIS adopted a classification where any bearded iris up to 16 inches in height was considered a dwarf. The Dwarf Iris Society refused to accept this however, and the result was a schism between the two groups, with the DIS having its own judging standards and its own system of awards. This state of affairs was untenable, and by 1958, it was clear that the classification problem needed serious rethinking. The final outcome was abandoning the simple division of dwarf, intermediate, and tall, and replacing it with four "median" classes in between the dwarfs and the talls. The intermediate class remained, but now there would also be a new class for "lilliputs" and two more classes in the intermediate height range, one for small TBs (border bearded) and one for the dainty diploid "table irises" (miniature tall bearded). So the new pumila/TB hybrids now had their own class, but what should they be called? Douglas's name "lilliput" was deemed a bit too fanciful. The final decision was to call them "standard dwarf bearded" and refer to the smaller true dwarfs as "miniature dwarf bearded". The Dwarf Iris Society would continue to promote only the MDBs, while a new organization, the Median Iris Society, was created to promote the four median classes: SDB, IB, MTB, and BB. The result is a slightly perplexing situation where the SDBs, although having the word "dwarf" as part of their name, are technically medians, not dwarfs. This brand new type of iris shook up the conventional thinking of the time, but the result was much better than if they had been forced into either the dwarf or intermediate categories. Having their own class and their own awards gave great encouragement to breeders striving to improve them. And the improvements came rapidly. Breeders like Bee Warburton and Bennett Jones were at work from the beginning, scarcely behind Cook and Douglas in producing new SDBs. Before long, most hybridizers were no longer crossing Iris pumila with TBs to produce new SDBs. It was easier to simply cross the existing SDBs with each other, and the results were usually better too. The influence of the SDBs extended beyond their own class. Today, most IBs come from crossing SDBs with TBs, and most MDBs derive from SDBs as well. SDB breeding produced some extraordinary surprises. It was originally thought that some of the recessive colors and patterns, such as pink and plicata, could only appear in TBs. But it did not take long before they began showing up in SDBs as well. Today's SDBs have virtually all the colors and patterns seen in TBs, as well as the "spot pattern" inherited from Iris pumila. I think it is fair to say they are the most varied class of irises in existence. In the nearly 65 years since the first SDBs were introduced, there has been a steady improvement in form and substance. Bennett Jones's creamy white 'Cotton Blossom' was hailed as an early improvement in form, with wide round petals and light ruffling. But the greatest breakthrough was Paul Black's 'Chubby Cheeks' in 1985. A prodigious parent for decades, this iris and its descendants set a new standard of form for the entire class. SDBs are deservedly popular, and not only for their varied colors and appealing flower form. They bloom about a month earlier than TBs in most climates, greatly extending the iris season. Furthermore, their size makes them more versatile in garden design than their larger cousins. They can be tucked in next to a doorway, along a path, or even used in small "postage stamp" backyards where TBs would be out of scale. It's hard to imagine the iris world without them. And we owe their very existence too a few creative souls whose curiosity prompted them to step outside the status quo and try something different. Who can say where the next great iris success story will come from? As I was organizing my photos the other day I ran across some photos of one of my favorite irises, 'Peach Royale'. I saw a lovely clump online years ago, but the only source I could find was sold out, year after year. Finally, in 2009, I got my order in on time. In its first year it proved to be worth the wait, and I look forward to it each year. 'Peach Royale' was hybridized by Meininger in 1999, and it is among the first of my irises to bloom. I like the early bloomers, because it gets very hot here early in the year, and any iris that dawdles into bloom in May is likely to have a short career. 'Peach Royale' lasts a long time, both because of the early bloom and because of the high bud count on the stalks. It fades beautifully, getting lighter around the edges. I have it planted with 'Spin Off' (Maryott, 1986) , which has the same magenta color that appears in the falls of 'Peach Royale'. Here it is glowing in the sun. With verbascum 'Southern Charm' and pelargoniums. If you are looking for a nice tallish iris (34-36") in this color range, I recommend 'Peach Royale' for its foliage, long bloom period, and beauty in the garden. If you grow this iris, please let us know how it does in your part of the world in the comments, below. If there’s anything that is generally understood about Louisiana irises it is that they like water. As these irises have risen from obscurity to popularity among gardeners, however, their promoters have had to walk a fine line in describing their water needs. On the one hand, it has been important to convince people that these “swamp plants” do not have to grow in standing water. Gardeners can succeed quite well with them in a bed alongside annuals and perennials of many kinds. On the other, optimal performance may not be attained if their Louisiana irises get only the amount of water that the “average” plant needs. Louisianas suffer if they get too dry, even for a brief period. They require consistent moisture. If they dry out during an even brief drought, especially from spring through summer, they will begin to have scruffy foliage and, in the extreme, go essentially dormant. Generally, with insufficient water, they enter an in-between state in which much of the foliage is just yellowed and unattractive. This is hardly a fatal condition, but it is not a pleasing sight. Ample water is the preventative. (Soil fertility is also critical, but that is mostly another story). The thirstiest Louisiana, Iris giganticaerulea, in a swamp in Jean Lafitte, LA. I. brevicaulis, the least thirsty of the species, growing in Gary Babin's Baton Rouge backyard, nowhere near standing water. Different Louisiana irises may have a greater or lesser tolerance for insufficient moisture. In a separate series of blogs, Joe Musacchia is describing the background and characteristics of the species that are the foundation of today’s cultivars. For present purposes, it is enough to say that some of the species (Iris giganticaerulea and I. nelsonii) are indeed swamp dwellers, found growing in standing water. (The East Coast species I. hexagona appears to like the same or similar conditions as I. giganticaerulea, but this iris has been used only rarely in developing the modern cultivars.) At the other extreme, I. brevicaulis is an inhabitant of low, damp spots, but is not generally found in anything beyond the mucky edges of water. I. fulva is intermediate in this regard, often the inhabitant of wet ditches and sloughs that may hold water all or most of the year. The water requirements of a cultivar will depend upon the often obscure or unknown genetic mix of these species in its background. The issue is how to deal with the water needs of Louisiana irises so that they are respectable citizens of the garden when not in bloom, as well as how to encourage plentiful and beautiful flowers. There are any number of approaches that will work so long as the result is that the irises remain consistently wet. One could drag out a hose and attend to their thirsty cravings by hand watering. Not many of us would elect that course, at least for very long. I once used a sprinkler placed around the garden on a rotating basis, but even that got old, and I was not really as consistent as necessary. I had reasoned that in the New Orleans area where there are 60 inches of rainfall annually and where the irises are native, it should not be necessary to take herculean steps to water these plants. I was wrong, and I was never satisfied with the way my irises looked in the hot summer months. A switch to a series of sprinklers each on a timer was a huge improvement. That arrangement created the consistency of moisture that the irises require, and for the first time, the foliage on my irises remained green and attractive right through the summer heat. Only in the fall when the new growth cycle began did I have to apply serious work to clean up the iris foliage. The weeds responded well to this approach also. I found it difficult to keep up with the weeding, especially with some noxious non-native perennials, such as alligator weed. 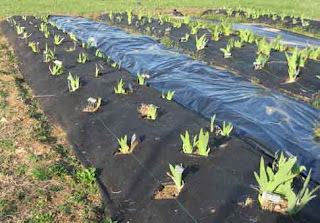 When I operated a nursery, Zydeco Louisiana Iris Garden, I had grown many plants in half barrels with no drain holes. That worked well generally, but most of those barrels were at another location, not in my home garden. My primary objective at home has been to maintain an attractive landscape and not have it look like a production farm, even though I did use much of the yard space for nursery operations. I was in the market for water-holding containers without an industrial appearance. A mortar mixing tub from Home Depot, a future home for Louisiana irises. The solution came to me in an email from Wayland Rudkin. A California hybridizer, Wayland sent me a picture of his ‘Ginny’s Choice’, later a Debaillon Award winner, growing in a shallow tub of the kind sold in the construction sections at Home Depot and Lowe’s for mixing mortar. The tub in Wayland’s picture was packed with happy, healthy looking irises. These mixing tubs are sold in two sizes, one about six inches deep that measures 18 by 24 inches and the other two inches deeper and slightly longer and wider. There are no drain holes. The smaller size sells for between six and seven dollars and the larger between twelve and thirteen dollars. They are black and made of some sort of thick plastic material. They will crack if hit hard, stepped on, or lifted while full of soil, but they otherwise seem sturdy and probably are reasonably long lasting. These trays can be sunk into the ground or placed on the surface. I opted for the smaller, shallower tubs for reasons of economy and to maximize the number of cultivars I can grow. I have replaced most of my iris beds with these mixing tubs set one next to the other on the soil surface or on landscape fabric in a few areas. The rims of the tubs can be overlapped to prevent weeds from growing between them. I have found that the tubs currently sold by Home Depot work better for overlapping than the ones from Lowe’s because of a flatter rim. The tubs can be angled slightly to accommodate curved beds or walkways. Mixing tubs in place but not yet mulched. A garden path with tubs cleverly disguised by rows of bricks and Live Oak leaf mulch. If the tubs are not dug into the soil, it is necessary to resort to camouflage for an unobtrusive look. In my case, I lined the paths in my garden with bricks stacked two or three high. When mulch is added and the irises are growing well, the tubs are essentially hidden, and the look, to me, appears natural. After two and a half years, I consider growing Louisiana irises in these tubs to be a successful experiment. The irises so far have grown very well and bloomed beautifully. Like irises in beds, I anticipate that the tubs will have to be reworked periodically. The soil undoubtedly will have to be replenished, although I have added an inch or so each year. Either there is a bit of subsidence or some soil washes out, but in either case I try to keep the soil level near the top in order to allow maximum room for root development and to prevent too much standing water. If the trays are full or nearly full of soil, evaporation quickly takes care of any surface moisture that might attract mosquitoes. I did worry when I began using the mixing tubs that six inches of soil would not be sufficient for good growth of the irises. I have found only a few varieties with roots so long that they hit the bottom of the tubs and then flatten across the bottom. Even with those, the irises appear to grow happily. Except for cost, I probably would have opted for tubs two inches deeper, but I have not detected any problem with the shallower model. Garden scenes during the first and second seasons with the tubs in place. I will not go so far as to say that weeding has become a delight, but it is much easier to pluck a weed from a mucky bog than from garden soil. Many common weeds do not like the bogs, although one can expect a few new ones to appear. The iris bogs are no replacement for diligence, though, and they will look bad if unattended. Of course, any perennial weeds growing beneath the tubs will be entirely frustrated. This gives me great pleasure. A bog replacement for normal beds does not require a landscape of uninterrupted Louisiana irises. 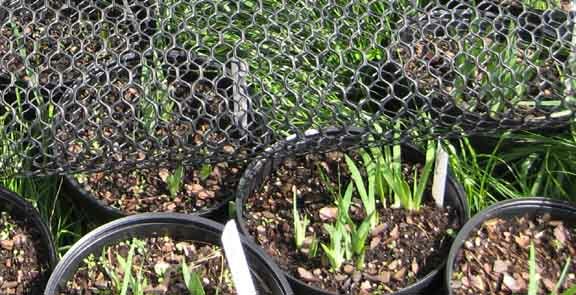 There are many interesting plants not often found in the garden that can be grown in the tubs with the irises. Marsh Fern (Thelypteris palustris) and various forms of papyrus thrive under these conditions. I devote one entire tub to a Royal Fern (Osmunda regalis), which provides great texture that contrasts nicely with iris foliage. Pickerel Weed (Pontederia cordata) has beautiful blue-purple flowers and also a nice contrast of foliage texture. The deep red foliage of the hybrid Crinum‘Menehune’, Red Bog Lily, is a wonderful accent, also. The use of little bogs for irises opens up a new palette of companion plants. There are some issues that must be dealt with if employing bog culture. I have found a few cultivars that do not thrive in the tubs. These seem prefer a good garden bed but with ample moisture. There are not many, however, and trial and error is the only way I know of to discover this preference. The shallow tubs will dry out quickly if not watered. I had thought that this approach would be a better way to reduce the amount of water I use. That has not been the case. When I apply water, however, the irises get to grow in boggy conditions, and almost all varieties thrive year round. 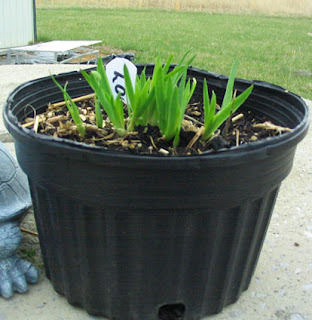 I have never been sure how to fertilize irises grown in containers that do not drain. Fertilization is the second key to success with Louisianas. All the fertilizer rate recommendations assume beds or containers through which water drains rather than accumulates. I have no idea what happens with the chemistry in those tubs. I have used mainly time release fertilizers applied as if the tubs were containers with drain holes. It has seemed to work, but I am sure there is a much more refined and informed approach that would be preferable. I suppose a container system would be better that more closely emulated a real bog in which there is some natural, albeit very slow, movement of water. While I regard the creation of iris bogs using mixing tubs to be a successful experiment, it undoubtedly is not one that should be tried without modification in all parts of the country. The weather in, say, Montana, may argue for a different approach. But a key to success with Louisiana irises is water, regardless of how it is delivered. Many of the improvements in irises have been made by the backyard gardener, and some of their creations have won The Dykes Medal. You can spend a small fortune, hunting up fancy tweezers and paint brushes, but it's possible to breed irises without all this. When I started my rebloom program, I had a child in elementary school, and two in high school, so I couldn't justify spending much money on the iris program. I bought a cheap iris colletion from Schreiners and the next year I ran across a really cheap fall blooming iris collection from Fields, a mail order catalog. 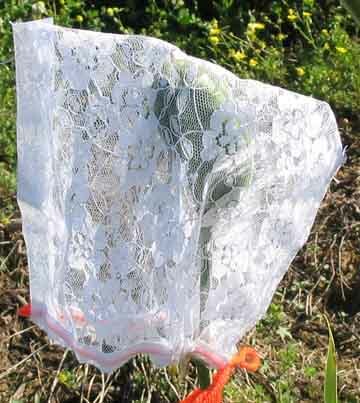 Then, I bought a few rebloomers from Monty Byers. 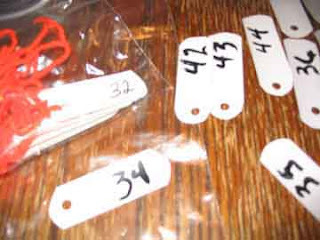 An empty milk jug, cut into strips, and then cut again, made good tags. I punched holes in one corner, with a hole punch, and used some orange yarn from my crochet bag to make ties. They were neat, but the birds really liked them, too, and used several in building their spring nests. If one was missing, I learned to look to the tree tops. The tags would glisten and reflect sunshine from up in the trees. After I moved to Allen county in 2003, I switched to strips of plastic venetian blinds shown below. To prevent fading, I use paint markers. I made 150 tags so I would not have to reuse any during any season. Early on, I bought a couple of pair of tweezers from Wal-Mart. I stressed over the method of pollen transfer until I found I was comfortable with using my ring finger as the implement of transfer. Works fine for me. 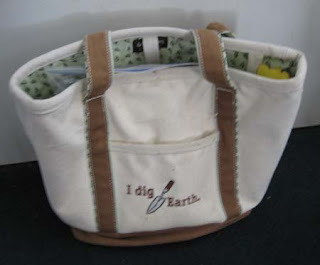 A few years back, I bought a large garden bag that will hold all of my hybridizing equipment, and then some. Before the new bag, I would put everything in a gallon size ziplock bag. The new bag is lined with pockets on the inside, which is convenient for pollen envelopes, tweezers, seed packets, nozzles for the hose, etc.. It even has a clip for my keys, if I choose to use it. The first summer I was in Allen County, 2004, a pod went missing. It was my favorite from 'Strictly Ballroom' X 'Mariposa Skies.' Sorry, I do not have pictures of the irises. I spent way too much time looking for the pod, but with absolutely no luck. The following winter I made a bunch of these lace bonnets to protect my pods from the deer. Haven't lost a pod since 2004. Once the seed are harvested from the pods they are usually wet or at least damp and they need a home until time to plant. 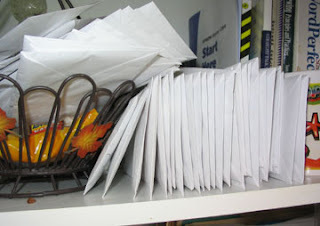 Rather than take chances of getting the seed mixed up, it's just easier to go straight to the envelopes. I put all of the permanent information onto the envelope, pod parent, pollen parent, and seed count, then I put the seed into the envelopes. I place it/them on an envelope rack to dry. I shake the envelope each day and turn it upside down. This is to make sure all seed fall to the other side. They are usually dry within a week and can rest until planting time at the end of Oct. The soil must be cool. Soil should be placed in the pots about six weeks before the seed are planted. A natural settling of the soil in the pots will leave air in the soil, important, where tamping does not. 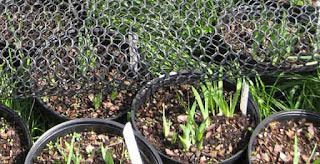 In my zone 6 garden it's important to put chicken wire (mine is plastic and reusable) over the pots to keep out the vermin. In my zone 6 garden the average date to expect sprouts is April 1. As I've grown older and more crippled, I've adjusted the way I care for my iris. The cost of my operation went up at the same time. DeWitt woven landscape fabric is really good. I buy it in big rolls that will cover about five beds. I like the stuff with the green lines because it helps make straight rows and I need all the help I can get. Each spring I must check for crowding and cut the landscape fabric where needed. I use a thick grade of black plastic for the paths. I use a piece of pvc pipe with paint markers every six inches to measure between plants. If you want to make some iris crosses, but don't think you can afford the equipment? Please give it another thought. Be creative. We need reblooming hybridizers in the middle and cooler states, zones 4-6. To get rebloom you will need to use really strong rebloom stock. I'm always willing to discuss anything iris! Just find me on Facebook or e-mail me at bridgeintime@aol.com. Put "irises" in the subject line. Good luck. In 1963, the planning and development of the "First International Iris Symposium"
Collaborated since 1997 with the Department of Plant Biology of the University "La Sapienza" in Rome by participating in meetings and seminars. Collaborated since 1998 with the University "La Sapienza" in Rome and The Lynnean Society in London to promote the Iris International Conference "Iris & Iridaceae: Diversity and Methodology." In 2006, the planning and development of the "Second International Iris Symposium." Premio Firenze also took part in exhibitions and specialized events in the field of landscape and gardening, organized exhibitions, courses in hybridization, courses for judges and lectures in schools. The Iris Garden was set up on a hilly land previously cultivated but now surrounded by olive trees as well as other plants of the native Tuscan collections including: cypress trees, Judas trees (Cercis siliquastrum L.), strawberry trees (Arbutus unedo L.), laurel (Laurus nobilis L.) and some varieties of maples. Irises are accompanied by roses, and also bushes to highlight paths and walkways. But it is the iris plants and their variety of forms and colors that almost completely cover the garden and when they are in full bloom turn it into a colorful landscape. The vast majority of irises are tall bearded (almost 3000), but there are also intermediate, border and dwarf irises. 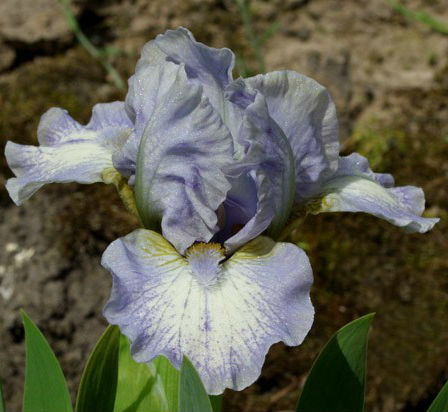 The international competition variety has practically guaranteed continued improvement and renovation of the main iris collection, making it one of the largest and interesting in the world. The garden also contains Siberian irises, Pacific Coast Native, spurias, and around the pond area there are some Louisiana, pseudoacorus and Japanese irises. The collection of the American Dykes Medal Winners since 1927 to today. Some historic irises from the Presby Memorial Garden in Montclair, NJ. Historic irises from the Prague Botanical Garden, the Czech Republic. A full collection of plants of the first and second prize winners of the international competition since 1957. And also a selection of all the plants that participated in the competition, organized by years, from the first competition to date. A part of the garden was reserved for ARSIA, a local Tuscan agency focused on development and innovation in the agriculture and forestry industry, and the plants included were chosen for their conservation of genetic material of the genus iris. Note: This article contains information originally shared online in Italian by Saverio Pepe, a resident of Florence, who kindly gave permission to use his material and images for this blog post. The pictures on Part II are all from Jill Bonino who participated in Premio Firenze as a judge in 2012.